In interviews he reveals a careful and introspective eloquence about the conceptual framework of his album. 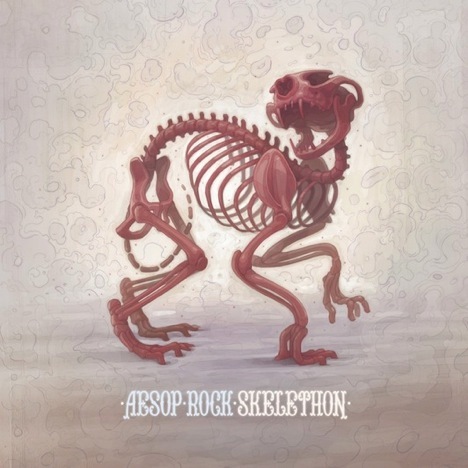 But rapper Aesop Rock (Matthias Bavitz) is just as apt to drop the gate for verbiage to fire on overdrive like an over-stimulated James Joyce narrating a late-night pillow fight. Each song lyrically replete, Skelethon chronicles a rough period in Bavitz’s life, themed, in his words, by the “death of friends, house plants, and relationships”. It’s characteristically dark, and can get a little intense. But it also recounts experiences from his life that bring rootedness and meaning. Even the quirky “Fryerstarter” converts trips to Bob’s Donuts into religious experiences that provided Bavitz with home-away-from-home New York as he settled in California. If you can withstand the wordiness and appreciate a unique and headier rap style, Skelethon could be worth digging out.